Expects Rs 2,800cr revenues from new stores. 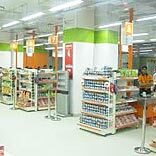 Spencer’s Retail, the RPG group, plans to focus strongly on hyper-format stores, for which it will invest Rs 600 crore. According to Shashwat Goenka, sector head, Spencer’s Retail, the company plans 80 hyper stores in the next two years. As of now, the company has 132 stores, including 26 hyper stores, 14 super market and 92 convenience stores. This time the retailer will focus on North India including UP and Delhi NCR, East including West Bengal and Chhattisgarh and South including Andhra Pradesh, Tamil Nadu and Karnataka. The company has already signed up the property agreement for 68 stores and looking forward to open 12 stores in this year and 15 stores by next years. Spencer’s expects the new stores’ revenue to touch Rs 2,800 crore in 2014-15.